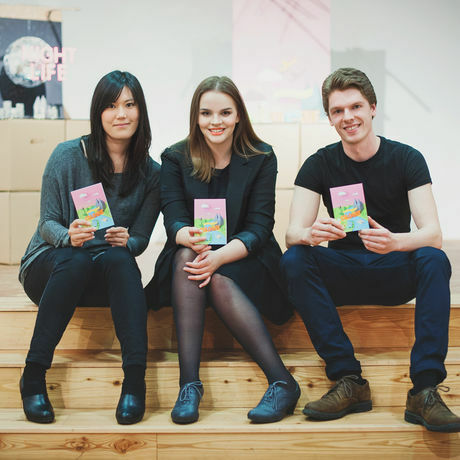 Jaqueline Diedam (Brazil), Raoul Döring (Germany) and Yuki Fukuda (Japan) are three designers living and working in Cologne, Germany. With different professional backgrounds in graphic design, photography, illustration and product design the team is not only diverse in their talents but also cultural backgrounds. During their studies of Integrated Design at the Köln International School of Design they first came together to work on a self initiated project about life in Cologne. The outcome is a somewhat different guide book called “Not just another guide to Cologne”. Its purpose is to help international students, travellers and locals to explore the city life from a different perspective with a fresh and multicultural concept at its core. During the project the team also specialised in the area of paper craft. Building intrinsic, colourful landscapes and abstract models of places, objects and even local food of Cologne they used these models to illustrate their guide book instead of photographs. With a nomination for the “German Design Award 2016” and support by Colognes largest educational institutions TH Köln, KISD and University of Cologne the team now released a second, renewed and extended edition of the city guide.